We have Hundreds of Used Electric Forklifts to Choose From Nationwide!!! 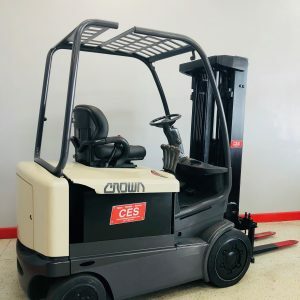 Electric forklift products are a top choice in many work environments as the manufacturers improve the efficiency and focus on electronic ones that can be used in various environments. 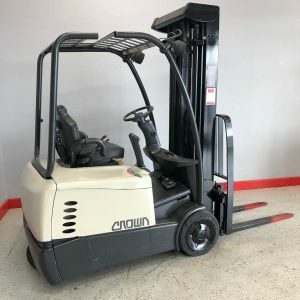 Many of these pre-owned electric forklifts offer stronger batteries and additional optional charging systems that allow for more running time. Environmentally speaking, many companies choose this over a gas or propane one simply because of they produce no emissions. 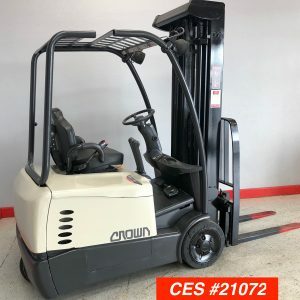 Used electric forklifts for sale are available with three wheels or four wheels. 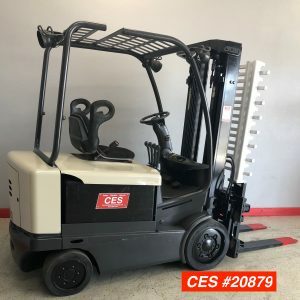 The right turning radius of a forklift like this makes it ideal for turning in small aisles. As mentioned above, both styles are run by a motor meaning your work environment is emission and exhaust free creating a healthier and happier workspace. These products are ideal for indoor use with cushion tires and low noise. 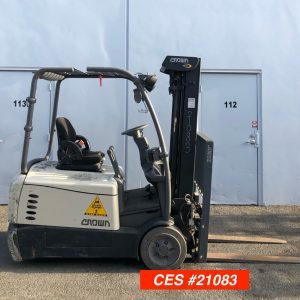 A three-wheel forklift has a single drive wheel in the rear center of the it. The rear wheel steers and turns the lift while the front wheel drives it. Our three-wheel smaller frame makes for a quick turning radius. A four-wheel can travel longer distances than a three-wheel. It can turn tight corners. If you need a larger lift capacity, the four-wheel offers the support needed. Searching for the best equipment for your business? We have hundreds of new and used fork lifts for you to choose from, with a wide range of high-quality models to suit every business, budget and requirement. From stand up to reach, four-directional, turret and other designs, our collection includes a vast range of models. We’ve been supplying high-quality products and other equipment to businesses in California and nationwide for more than 20 years. Located at 2275 S La Crosse Ave #2010 in Colton, our team is always available to provide the expertise, knowledge and assistance you need. Ready to start shopping? 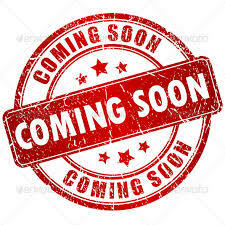 For more information, please contact us now. You can also learn more about the benefits of using these. Order Pickers. Designed for picking out individual pallets and items, order pickers are compact and ideal for small warehouses and retail store rooms. Sit Downs. These versatile products are ideal for store rooms, warehouses and other environments in which pallets and shelving are used for storage. Four-Directionals. Capable of rotating their drive wheels 90°, four-directionals eliminate the need for right-angle turns, providing enhanced maneuverability. Turrets. Designed for narrow aisles and high-level pallet handling, turrets are ideal for environments in which you want to maximize your storage capabilities. 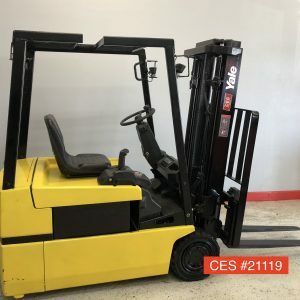 We also stock a large range of stackers, pallet jacks and other warehouse equipment, making it easy for you to fit your entire warehouse, storeroom or other place of business with modern, energy efficient equipment. Advantages of Buying Our Equipment? Tired of paying for fuel? 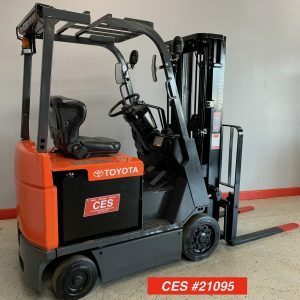 Efficient and designed for plug-in charging, these things cost almost nothing to run when compared to conventional diesel or propane, reducing your costs over the long term. 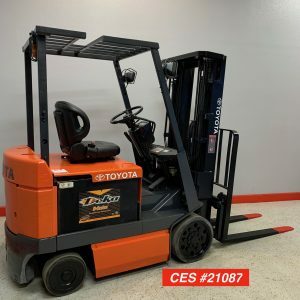 Compact and maneuverable, these are ideal for small warehouses, retail store rooms, fulfillment centers and other environments. Many have smaller turning radiuses, making them easy to maneuver between aisles of storage shelving. Want to reduce your carbon footprint? Electric versions of this have almost zero emissions, allowing you to significantly reduce your company’s emissions, create a pollution-free workplace and produce a lower impact on the environment. Unlike other machines, these are almost completely silent, helping you reduce the impact of noise pollution in the workplace and create a more welcoming, enjoyable environment for your employees. Do you need this for one day, week or month? 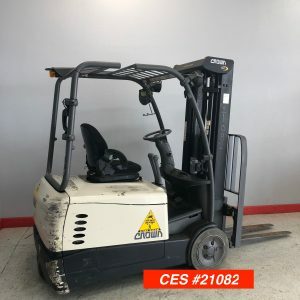 In addition to our extensive range of pre-owned forklifts for sale, we offer a complete range of products and other equipment for rent with competitive daily, weekly and monthly rates. Our rentals page includes all the information you need – including daily, weekly and monthly rental pricing. Searching for a specific one? We update our stock of pre-owned products in good condition daily, meaning we’ll almost always have one or several models in stock that match your requirements and budget. Contact us now to talk to a member of our experienced team and learn more about these products, order pickers, pallet jacks and other equipment we have available.